Poopsticker.com - Poop is awesome, especially in sticker form. Poop is funny, It's even funny to say. Come on, say it out loud with us, "Poop. Poop. Poop!" And sadly (or happily) to say, it's just that sort of mind-set that has brought about PoopSticker.com. Poop Stickers are meant to make you laugh. They make us laugh like crazy and we hope you find them just as humorus. 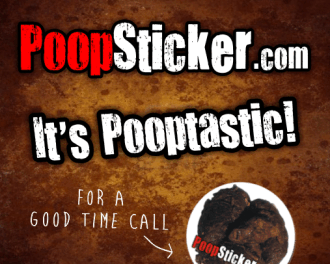 Get some Poop Stickers today and join in the Poop Stickery! 1. To Poop or not to Poop, that is the question. 2. So many Poops, so little time. 3. Be the Poop that you wish to see in the world. 4. Poop is what happens to you while you're busy making other plans. 5. There are only two ways to Poop through life. One is as though nothing is a miracle. The other is as though everything is a miracle. 6. A Poop is like a tea bag; you never know how strong it is until it's in hot water. 7. That which will not Poop us, makes us stronger. 8. Not all of us can do great Poops. But we can do small Poops with great love. 9. Sometimes the questions are complicated but the Poops are simple. Than never to have Pooped at all. And as we leave you with the world's Poopiest advise. We hope you have enjoyed it and... Long live Poop Stickery!